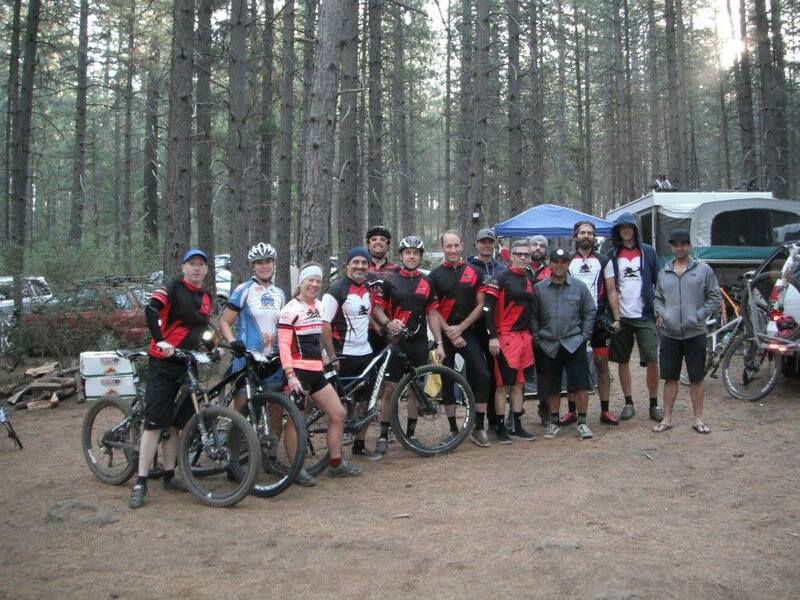 On Saturday May 2nd I was a part of a 3 woman relay team for the 8 hours of Boggs mountain bike race. The race site was located in the Boggs demonstration forest near Clearlake and Middletown, CA (just a bit north of Calistoga). There are all levels of riders for this race and there are many events all going at the same time: Solo 8 hour riders, 2-person (M/W/Coed) and 3-person (M/W/Coed) teams. Boggs is a popular race and usually sells out within days. The format is to do as many laps as you can in 8 hours. The scoring is based on number of laps, then time. My husband also did this race on a 3 man team, so we headed out about 1pm on Friday to beat the traffic. We arrived on-site and got our race packets. My husband pre-rode the course but I didn’t because I preferred to rest my legs. Boggs is HUGE for camping. Most racers camp – but I really need a bed, a bathroom and a shower the night before a race. So we booked a modest little hotel just 10 minutes from the site. 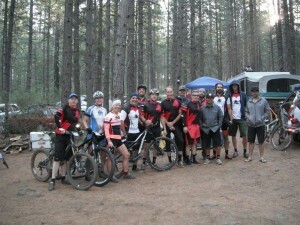 My husband did his pre-ride and I hung out at the campsite where we had a gang all camping together. We BBQ’d there and when it got dark and started cooling down we headed to hour hotel. That night we prepped our bikes with the number plates, re-lubed the chains (very dusty conditions) and checked tire air pressure. On Saturday we got up at 6am and got our breakfast and showers! Packed everything and headed to the site at 7. We arrived in plenty of time and parked at our gang’s campsite. I took my Hammer Race Supreme and my Hammer Anti-fatique capsules and sipped water until it was time to head to the starting line. In my bottle was a Hammer Fizz tablet (today it was Mango). This was the 10th annual Boggs race so they have things pretty well organized. The race is a mass start at 8am and I was the opening rider for my team. The opening lap is tough because you are fighting A LOT of other riders and we go an extra loop of almost 4 miles (a crowd thinning technique – and it may not seem like a lot of miles to a road rider but when your total lap is only 10 miles – making the opener 14 is a big difference). The race started right on time and off we went. I hung in the middle to the back of the pack, which is where I belong pace-wise but does put you in the thick of things. Even with a modest fire road climb you are still elbow to elbow with fellow racers, shortly the course turns onto a single-track and we came to a complete stop while everyone filed in (this is commonly known in mountain bike races as a “conga line”). I take things in stride and wait my turn. This year the event producer incorporated more single-track into the course (and less fire road), while this makes for a funner course for the racers it’s also more challenging both from a skills perspective and a crowds/other riders view point. After getting moving on the single track with several hundred of my ‘best friends’ – we were able to finally keep it moving. After just under 30 minutes I actually passed through the Start/Transition/Finish arch – in case you’re wondering – yes this initial 4 miles is still timed and part of the course. But any subsequent laps don’t include it. Then the ‘real’ fun begins. We pass through the main race area and begin to climb. It was a rocky technical climb with lots of walking involved on this first lap especially, but it gets better. Soon after I’m able to really get going. The course offers a bit of everything terrain-wise in a shady cool forest setting. We would pop out onto a short fire road here and there, sometimes in the sun, but thankfully about 80% of the race is in the shade. During this lap I faced tight switchbacks, several hard rocky climbs, and smooth single track (watch out for the trees wanting to grab your handlebars!). After almost 2 hours, 14.5 miles and 1850 vertical the course drops you right back down into “race central” – as I came over the timing mat and headed for the bike exit, I saw my teammate take off. One lap down who knows how many to go. The riders on my team anticipated about a 1:20-1:30 loop for each of us – remember they didn’t have to do the add-on 4 miles that I did on my opener. So I had about 2.5 to 3 hours of wait time before my next lap. I chatted with some of our friends at the relay area, and saw a few friends who I didn’t know were racing – some of them coming in, some of them waiting for their teammates to finish a lap so they could head out. It’s actually really fun format and you get to see a lot of people in various states of racing. I headed back to our campsite and cleaned up a little. Changed out my bike shorts and tried to put my feet up and rest. I had a half of a PBJ and some other nibbles and water. Since you would NEVER want to be late for your teammate arriving in and sending you back out on the course – after about 2 hours I head back down to the transition area waiting for my rider to come in. I see her! And off I go on my team’s 4th lap. It’s now 1 pm and I’ve already ridden a hard 2 hour ride. I hit the technical climb again and I’m not doing and feeling so well. I walked up about 1/2 of it, get to the top and jump on my bike again. Meanwhile the ‘fast’ people are also coming around on their 5th-6th or more laps. On the technical downhill I had some riders close on my tail – so I ended up getting a little stressed out and going too fast and I took a slight spill. Nothing big. I jump back on my bike and continue the decent. Things got much better for me after that. I settled down and got my heart rate down, high-but within range. Again I’m hitting these pretty tough gravely climbs, and rolling fun single track downhills. Several of the climbs I wanted to give up and walk but I could see other riders – guys, younger gals some walking – and I knew I had to try and stay on the bike. I did. I was super happy I rode all the climbs. I’m a better climber than I am on the downhills so I was playing cat and mouse with a few riders – I’d pass them on the climbs and they’d get me on the downhills. In the end some got me and I got some others. Because of the race format, and that I was on a 3 Woman team – I knew none of the guys was my competitor – but there’s no age brackets on the relays so any gal could have been racing against me (and my team). I was shooting to make about a 1:25 lap time, but I came in a bit over that at 1:29. I’m still happy with that time. Mountain bike racing is funny in that they always change the courses from year-to-year. So it’s hard to compare my last year’s times. Overall I felt strong and it is such a fun race and weekend. 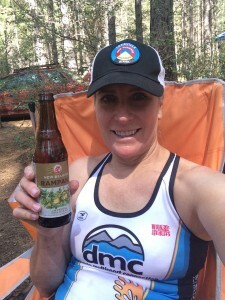 Since we weren’t racing on Sunday I agreed to ‘camp’ the second night – we partook of the flowing Lagunitas beer and the delicious meal that came with the race. We shared race stories and beers around the camp fire and not long after dark tired and dirty I headed for the tent and my sleeping bag. Hey that’s what camping’s all about right? My team took 7th out of 10 – completing 5 laps in 7:50:55. We were the fastest of the 3–Women teams completing 5 laps (there were teams that completed 6, and 7 laps).